We're wedding photographers who photograph weddings, portraits, and events in Edmonton, Alberta. Edmonton is a bustling capital city, that was built on the banks of the North Saskatchewan River. It is home to a stunning River Valley that keeps Edmontonian's active year round. With a population well over one million people Edmonton is North America's northernmost city which is how they became known as the "Gateway to the North"
Edmonton is a cultural, governmental and educational centre. Another nickname that Edmonton proudly represents is "Canada's Festival City" because it hosts a year-round slate of festivals. Edmonton's unprecedented growth has been through the absorption of five municipalities Strathcona, North Edmonton, West Edmonton, Beverly, and Jasper Place. Edmonton is a blue collar city and is proud to boost the Alberta economy by being host to staging points of large scale oil sands projects taking place in northern Alberta as well as large-scale diamond mining operations in the the North West Territories. The capital city is also home to the largest shopping mall in North America,West Edmonton Mall. When it comes to wedding venues in Edmonton there is one that stands out like no other. The Art Gallery of Alberta is perfect for your wedding ceremony and reception. As wedding photographers we have worked in many venues around the city and there is nothing like this in Edmonton or throughout Alberta for that matter. What makes this venue the perfect place for your wedding is the architecture. We also loved the ability to photograph the dance floor from a second or third level. The large windows provide lots of natural light and the corners of the staircase provide a darker option to make things more moody. For catering Zinc restaurant is located in the building and is a great option. We have dined in the restaurant and have been guests at events that they have catered and the food is fantastic. 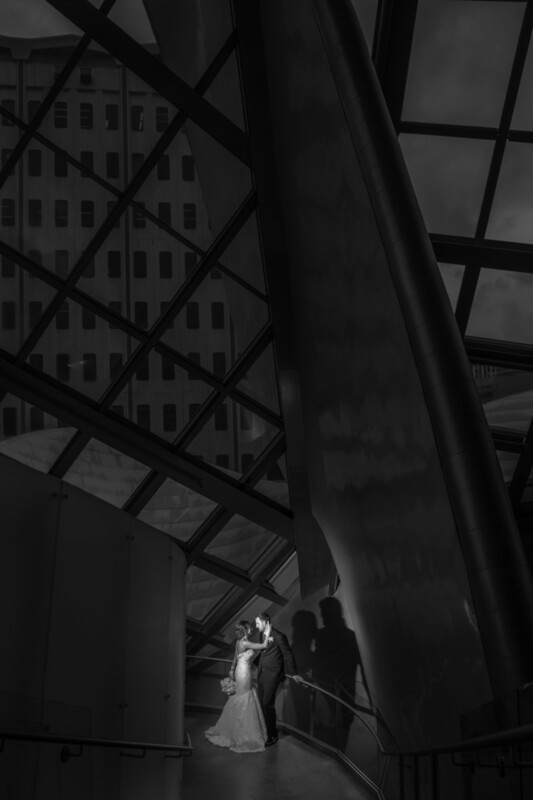 With the Art Gallery being located downtown there are many great options for your wedding photos. City Hall is right across the street so if your wedding is in the summer the fountains are a great spot to create timeless images. If your wedding is in the winter the ice rink is very festive complete with lights and music. On Torrie and Mike's wedding day the weather was not cooperating so they chose to stay inside for their portraits. With the Art Gallery there are so many great options to photograph in so we were extremely happy with the result. This is an outdoor venue that is located 10km south of Devon on Highway 60. Devonian Botanic Gardens wedding ceremonies are perfect for spring, summer or fall weddings. Some of the highlights of the gardens would be the Japanese Gardens. It features a bridge, waterfall, pond, walkways, and many different kinds of trees for a variety of photography locations. The gardens were opened in 1959 by the University of Alberta. It is the largest botanical garden in all of Alberta. This venue is perfect for a more intimate ceremony and reception. Located at 10229-105 street. The Yellowhead Brewery offers a unique wedding experience for up to 150 guests that very few Edmonton venues can provide. They also offer full catering and bar service with special beer brewed in house. The decor has a rustic vibe with wood beams, brick walls and nice ambient lighting. They also have a great feature with a raised stage for the wedding party and speeches. This is probably the most famous building in all of Edmonton. When celebrities or rock stars are in town this is the place they usually stay. For weddings this is definitely on the high end side but their ballrooms are incredible. Our favourite part of the evening is the first dance, and with the chandeliers and high ceilings it is like no other venue in the city. Located East of Edmonton just off of highway 14 Hastings Lake Gardens is perfect for outdoor or indoor wedding ceremonies. The best part of this location is there are so many options for your wedding portraits. Dot and Terry Ziegler are the owners and they have turned the property into a wedding couples dream location. The Country Lodge offers both indoor or outdoor wedding ceremonies, and also has the option to hold your wedding reception as well. It can hold up to 350 guests. It is located on the North side of Edmonton and just off the Anthony Henday on 127st. The wood finish and large chandeliers in the Grand Ballroom help to set the mood for your wedding. The Dining Room has a lot of natural light thanks to the large windows. The Windermere Golf and Country and Country Club opened its doors to weddings in 2011. This relatively new wedding venue is perfect for indoor or outdoor ceremonies and the club house is capable of holding 120-150 guests. It is located on the south side of Edmonton just off of Ellerslie road. Fantasyland Hotel just so happens to be inside the largest shopping mall in North America. Located on the West end of Edmonton this wedding venue is perfect for couples that would like to keep everything indoors. The ballroom has one of the nicest chandeliers in all of Edmonton helping to create the perfect mood for your first dance. The Oasis Centre is located on the West end of Edmonton and is one of the top wedding venues in Edmonton. With 24 ft ceilings, golden drapes marble pillars, rose quartz chandeliers the Grand Hall is second to none. Other highlights of the Oasis Centre would be the large garden behind the venue. It makes for a unique garden setting in the middle of a city. They also have a Bridal lounge and Grooms quarter to get ready in. The front foyer has a ton of natural light and is perfect for cocktail hour and even has a giant Koi tank. The Matrix Hotel is a modern venue for your wedding reception and ceremony. It is located just steps away from The Alberta Legislative Building. The Matrix offers 3 ballrooms to suite whatever size of wedding you are planning. The Quartz ballroom is at 250 guests, while The Amber room can hold up to 140 guests and for intimate ceremonies The Prism Room can hold up to 40 guests. If you are looking for photographers that are amazing and know the area extremely well than we are your team. From downtown Edmonton to the back roads of small towns we have experience all over Alberta. When it comes to locations it doesn't matter how many times we have worked at the Alberta Legislative Grounds we can still produce unique images, and tend to stay away from areas that other photographers flock too. We want your wedding day to be as stress free as possible. This location provides some of the best architecture that the city has to offer. We love working inside, outside, or blocks away with it in the background to give that urban feel to your perfect day. Is an amazing building that provides year round options for photography. In the summer the fountains make a "cool" backdrop as the mist will sometimes carry over to the couple on those hot summer days. In the winter there is ice skating and beautiful lights for a very festive feel. We love this location because it has so many options. If you like architecture the Government house is perfect. If you prefer more of a natural setting they have lots of green space around that area. It also provides some shelter if the weather is not cooperating. There are so many options downtown. If there isn't a specific place that you have in mind we know lots of unique spots like this LRT station for an urban feel to your images. This park is definitely a hidden gem when it comes to locations. We had a couple that was getting ready in Cameron Heights and when I saw the park I knew instantly that I could create something special there. The hills worked perfectly for what I had in my mind. Fort Edmonton Park has the capacity to hold massive weddings and also smaller intimate weddings if that is what you are looking for. They also provide options to have your photos there even if your wedding is not. The Citadel Theatre is a great indoor option if the weather is not cooperating. It has an small indoor garden with a waterfall on the wall. The large windows make this a great choice during the day with lots of natural light. Rice Howard Parkway is an urban location that offers an incredible view of Scotia Place. University of Alberta Arts Building is an amazing location for ceremonies and receptions. Muttart Conservatory is a good option for any season, but it can be very crowded. They have 4 indoor gardens that can be used, but you must book way in advance. Telus Field is a must for any baseball or softball fans! We have worked here a few times now and absolutely love it! Either right on the field or in the bleachers your engagement or wedding images will definitely stand out. This is a great location to just have your wedding portraits taken. It is now a historical building in Edmonton. Our favourite places in the house are the beautiful staircase, the study, and the sun room at the back of the house. The light comes in just perfectly in the sun room. Festival Place, Sherwood Park is very popular for anyone living in Sherwood Park. There are a few options for fountains and bridges. They also have nice stairways that we like using. It can be busy in the summer but there are usually areas that we can stay away from the crowds. Just don't go on Canada Day as it is extremely busy. When it comes to greenery in the city Mill Creek has you covered no matter where you decide to enter. They also have a few options for bridges which is always nice. We have a few favourite spots that involve the creek and the larger walking bridge. This is also a dog park so there are lots of 4 legged photo bombers running around. Strathearn Drive has one of the nicest views of downtown Edmonton. If you are looking for a skyline background then this is probably where you would want to go. Hawrelak Park is the biggest park in Edmonton. The nice part of Hawrelak is you can plan your session for anytime of the year there and it will still be beautiful. The winter has a huge skating rink which is always a nice option for engagement photos. Emily Murphy Park has a nice area full of trees. It also has quick access to the River Valley. Alberta Aviation Museum is an excellent choice to rent for your engagement or wedding portraits. The option for vintage planes is vast so you will not be disappointed. You must book ahead to arrange a time. The staff that we have worked with are always very accommodating. Location: Edmonton Art Gallery of Alberta, 2 Sir Winston Churchill Sq, Edmonton, AB T5J 2C1.